Overview. 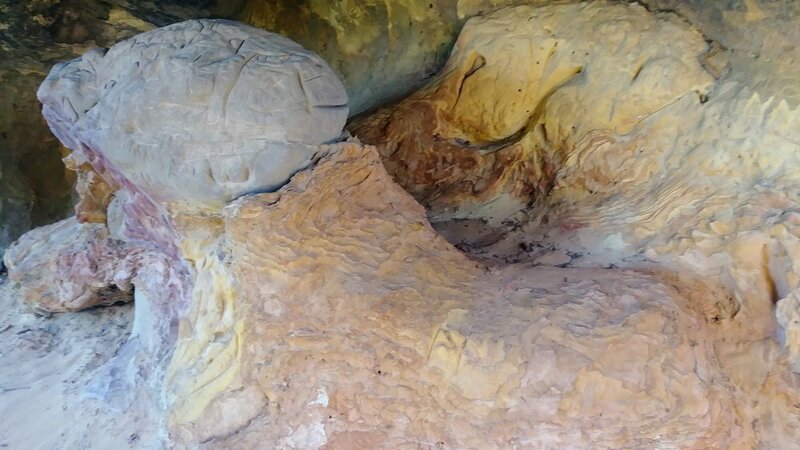 This is the quintessential hike in Red River Gorge with beautiful vistas, sandstone arches, and large rock shelters. We hiked this clockwise - making for a steep descent down Indian Staircase. If you'd like a little easier go of it, hike counterclockwise to ascend the staircase instead. Trail navigation. Begin on Bison Way Trail and follow it a little more than 1/2 mile to the intersection with Sheltowee Trace. Turn left (west) to continue on Sheltowee Trace. 1/4 mile later, you can turn right (north) on an unmarked, but well worn trail to take the easier route up Indian Staircase. Continuing on Sheltowee Trace on the forest floor, you'll hook around and ascend to Indian Arch. At mile 1.5, you'll have the option to add a worthwhile unmarked 1-mile (round trip) out-and-back where you can see Adena Arch. 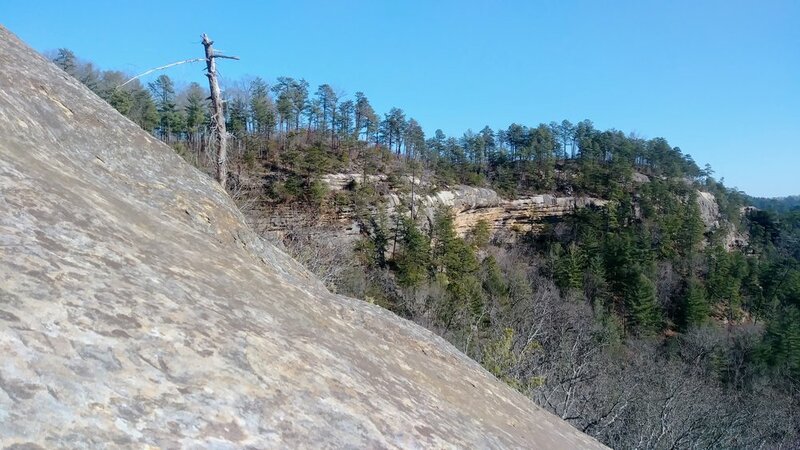 Once you return to Sheltowee Trace, you will continue on to hike around the rim of the gorge. Around the rim, you'll find a maze of user trails that lead to numerous campsites. The best rule of thumb is to stay to the right at trail intersections. 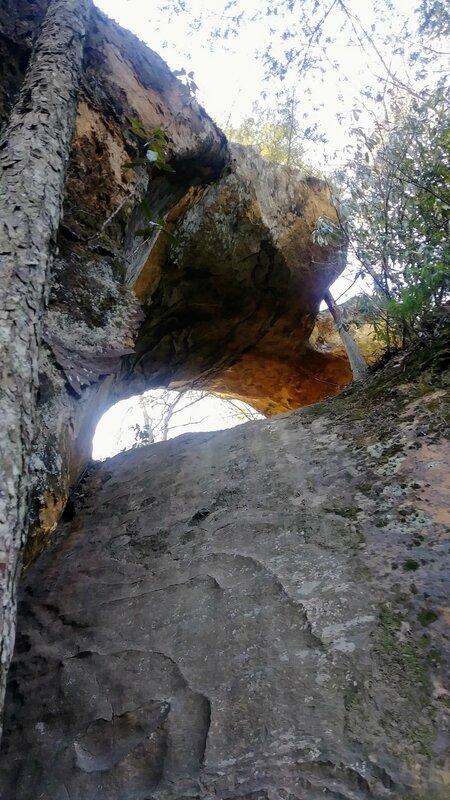 Continue your hike to enjoy the views and come to Frog's Head, a favorite rock feature at Red River Gorge. 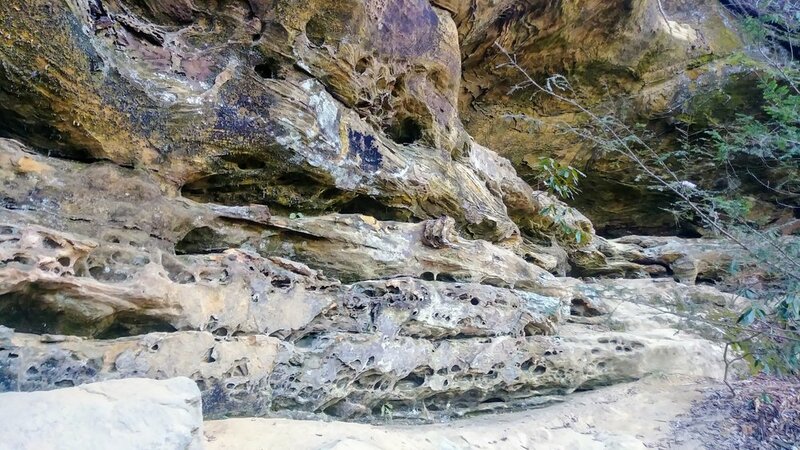 This is a great spot to stop for a snack or lunch - especially in warmer months. Continue your hike and descend Indian Staircase. This is a scramble, so be sure to stay low and maintain three points of contact. Do NOT attempt this descent in inclement weather. Once down, it's only 1/4-mile to Bison Way where you can return to your vehicle or you can continue up Sheltowee Trace to do a little exploring like we did. Red Belly having some fun with an icicle on Sheltowee Trace.